Ravi Bhandari, the co-owner of the complex who had leased out the premises was arrested because he was aware of the violations but had not taken action. Mumbai: A Mumbai fire station officer is among the three people arrested late on Saturday for the devastating fire at the two upscale restaurants in Mumbai's Kamala Mills complex that killed 14 people on 29 December. Ravi Bhandari, director of Kamala Mills and Utkarsh Vinod who supplied hookah to the restaurants, were arrested. But it is the arrest of the local fire station officer Rajendra Patil that is rare, primarily because feedback from fire department often determines the direction of the police probe. This time, public outrage over the loss of young lives - 11 of the 14 who were women, mostly in their twenties and thirties - had forced the government to order a probe by commissioner of the Brihanmumbai Municipal Corporation, or BMC, Ajoy Mehta. This inquiry looked into the role of the fire officers and others unlike the fire department's report that pinned the blame for the fire on restaurant managements. The report found that fire officer Rajendra Patil had certified that the restaurants - 1 Above and Mojo's Bistro - complied with fire safety norms just a week before embers from a hookah burnt down the place. The terrace was clear and there was no obstruction, he had reported on 23 December and attached photographs to back this claim. But when the fire broke out less than a week later, officials said highly-combustible material used by the restaurants to cover the terrace had contributed to the flames spreading rapidly and trapping the guests. Those structures couldn't have come up in just a week, Mr Mehta concluded in his report. "It is practically impossible to construct such a large terrace covering within such short time as it was totally refurbished on the date of incident 28-29 December 2017," his report said. According to the report, this implied that the officer had either given the fire safety report without visiting the site or had visited the restaurants but deliberately filed older photographs of the place. "In both cases, he has failed to perform his duty as expected," the city's municipal commissioner said. The Mumbai police had earlier arrested 11 people, five of them owners of the two rooftop pubs, 1 Above and Mojo's Bistro. 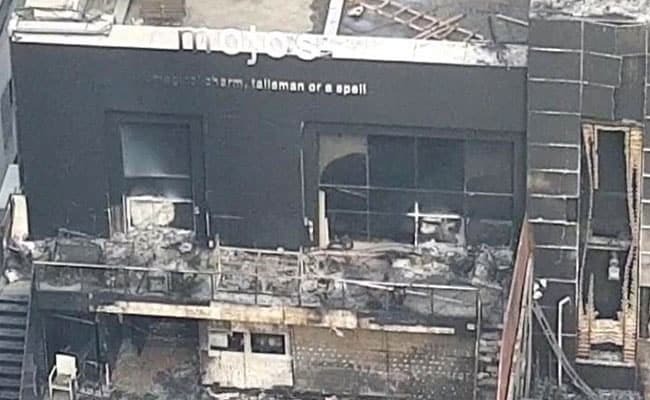 The fire had started from Mojo's Bistro but it was 1 Above, where most of the deaths had taken place, which bore the brunt of police action. Apart from 2 managers of 1 Above, three relatives of the owners and a friend were also arrested for sheltering them while they were on the run.